Transcendental Meditation can have a profound impact on many facets of our lives and a new study shows that it can also improve children’s academic performance. The study conducted at a California public middle school on 189 students showed that 41 percent of the meditating students gained at least one level in math performance. Students with the lowest levels of academic performance showed a significant improvement in overall academic achievement. If Transcendental Meditation can improve middle school students’ academic performance then why not try meditation with younger children? Plus, there’s a chance you may find it’s beneficial to other areas of your child’s lifestyle. Speaking from personal experience I can tell you that Transcendental Meditation has affected my son’s life. Read on to find out how, and learn how to implement meditation into your child’s lifestyle. My son has always been more active than many other children and as a toddler he had a hard time slowing down, especially at bedtime. Sometimes it would take hours to get him to fall asleep. It was during this time that I decided to implement Transcendental Meditation into his daily routine. At the time, I would sit quietly with him and ask him to close his eyes and pretend to go to sleep, since he was too young to understand what “meditate” meant. I would sit very close to him and follow his breath, so that we were breathing in unison. He seemed to really enjoy our “quiet time” together and after practicing it for a few weeks, he started to fall asleep almost as soon as I put him to bed. As he became a little older, I started using meditation again to help with his focus in school, as a way for him to calm himself and to teach him the importance of listening to his inner voice. We still practice together. Since he can be easily distracted, it’s easier for him when he is following my lead. We practice in the morning before school to give ourselves a fresh, clean slate and before bedtime as a release to help calm, soothe and prepare him for sleep. To try meditation with your child start by asking her to sit quietly and focus on her breathe – the younger you start with your child, the better. If your child has a hard time sitting still like mine does, try a change in scenery. One of our favorite ways to practice meditation is by laying outside on the grass and looking up at the clouds passing by. We focus on the cloud and watch them come and go and then slowly close our eyes and start meditating. This ritual is symbolic of our feelings and thoughts, coming and going. My son’s teachers have told me that at outside time he sometimes lays on the grass and looks up at the clouds. I can’t help but wonder if he is practicing the Transcendental Meditation without me. How fantastic that would be? Transcendental Meditation can have a profound impact on many facets of our lives and a new study shows that it can also improve children's academic performance. The study conducted at a California public middle school on 189 students�showed that 41 percent of the meditating students�gained at least one level in math performance. Students with the lowest levels of academic performance showed a significant improvement in overall academic achievement.� If�Transcendental Meditation can improve middle school students' academic performance then why not try meditation with younger children? Plus, there's a chance you may find it's beneficial to other areas of your child's lifestyle. Speaking from personal experience I can tell you that Transcendental Meditation has affected my son's life. 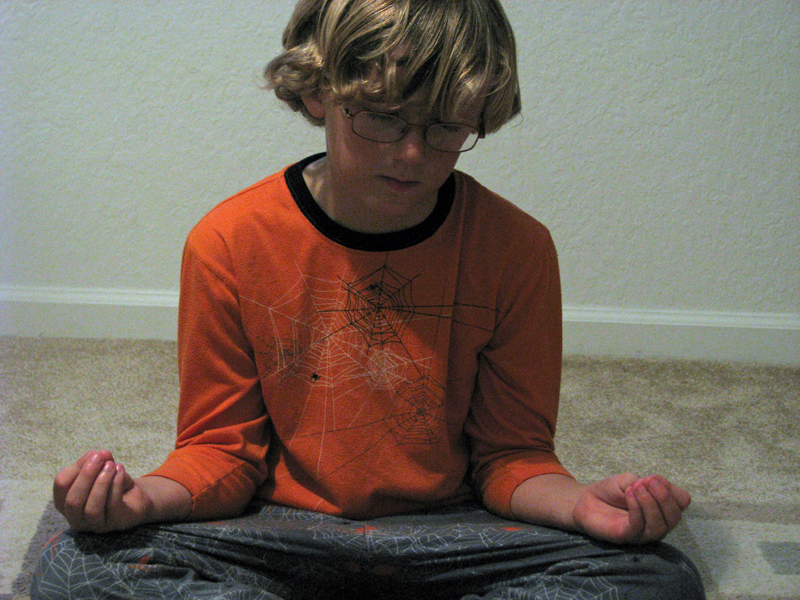 Read on to find out how,� and learn how to implement meditation into your child's lifestyle.